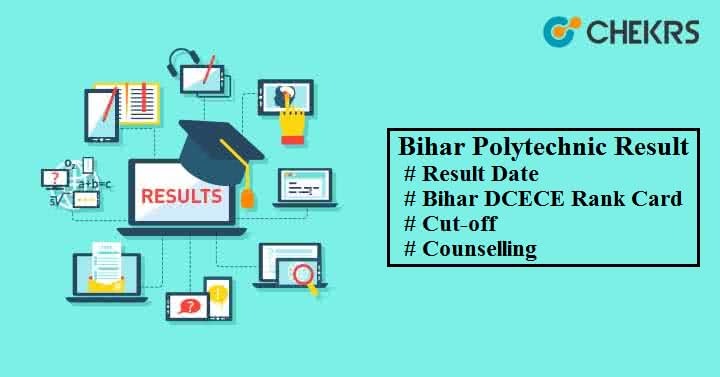 Bihar Polytechnic Result 2019: Bihar Combined Entrance Competitive Examination Board (BCECEB) will shortly announce the result of Bihar DCECE (Polytechnic) exam in online mode only. Candidates will be able to download their result and rank card after giving the exam in a successful manner. Take a look on Bihar DCECE Result Date mentioned in the table given below. Click on the download DCECE result link. You will see the Bihar DCECE Result 2019 in the pdf format. You can also go to the Download DCECE Rank Card present on the home page. Select your course name like PE, PPE, PM or PMD. BCECEB will publish the cut-off marks along with the result on its official website. Bihar Polytechnic Cutoff will be minimum marks required for admission in the any government or non-government polytechnic institution. Based on the candidate’s marks or rank in the exam, Merit List will be released for each course. Bihar DCECE Counselling Procedure include a number of steps like online registration, option form filling, seat allocation, document verification, counselling fee payment etc. It is conducted after the declaration of results in online mode. The authority will prepare a merit list and then they will call qualified candidates as per their rank preference. Seats will be offered to candidates based on merit rank, seats availability and choice form. Call Letter will be issued and report to allotted counselling venues with call letter and other required documents for verification.